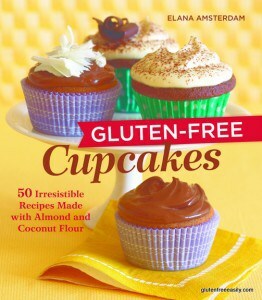 My dear friend Elana Amsterdam’s new cookbook, Gluten-Free Cupcakes: 50 Irresistible Cupcakes Made with Almond and Coconut Flour, arrived Friday (courtesy of Elana and 10 Speed Press). Yes, 50 cupcake recipes! Cupcakes that run the gamut from seemingly simple, like a gluten-free Vanilla or Vegan Chocolate Cupcake, or even today’s gluten-free Marble Cupcakes, to decadent, like German Chocolate Cupcakes. There are even savory cupcakes, aka muffins, like Scallion Goat Cheese Muffins. And irresistible is right! I haven’t had a cupcake since going gluten free and I already have several other great cookbooks in my queue for review. Yet I couldn’t resist dropping everything and making cupcakes. After reading Elana’s introduction and the comprehensive section on equipment, ingredients, measuring, and more, I flipped through the recipes one by one. So many gorgeous cupcakes, but it was the lovely chocolate and vanilla swirls of the Marble Cupcakes that caught my eye. The photo showed them frosted or unfrosted. Elana reports that one of her sons like them without frosting; the other likes them with frosting. I went for the no-frosting option and was perfectly happy with the results. Even Mr. GFE happily indulged, although with Elana’s cupcakes, indulgence is a relative thing. Ingredients are healthier choices like almond flour, coconut flour, eggs, grapeseed oil, cocoa powder, coconut milk, fruit, nuts, and agave nectar. I used our bees’ honey instead of agave nectar to make these beautiful marble cupcakes—a delightful mix of vanilla and chocolate goodness. Note that the bright orange yolks from my friends’ free-range chickens actually made the vanilla batter a yellow-orange when I made this recipe, which makes these look like Halloween cupcakes! Update: Elana and 10 Speed Press have graciously allowed me to share this recipe with my gfe readers—woohoo! You can also see the gorgeous photo from her Gluten-Free Cupcakes cookbook, which shows both the frosted and unfrosted versions. To make the vanilla batter, in a large bowl, combine the coconut flour and baking soda. In a medium bowl, whisk together the eggs, grapeseed oil, and agave nectar. Stir the wet ingredients into the coconut flour mixture with a large spoon until thoroughly combined. To make the chocolate batter, in a large bowl, combine the coconut flour, cocoa powder, and baking soda. In a medium bowl, whisk together the eggs, grapeseed oil, and agave nectar. Stir the wet ingredients into the coconut flour mixture with a large spoon until thoroughly combined. Fill each prepared muffin cup with 4 tablespoons of batter, alternating tablespoons of chocolate and vanilla, starting with chocolate batter and ending with vanilla. Use a toothpick to swirl the batter in figure eights. Bake for 18 to 22 minutes, until a toothpick inserted into the center of a cupcake comes out with just a few moist crumbs attached. 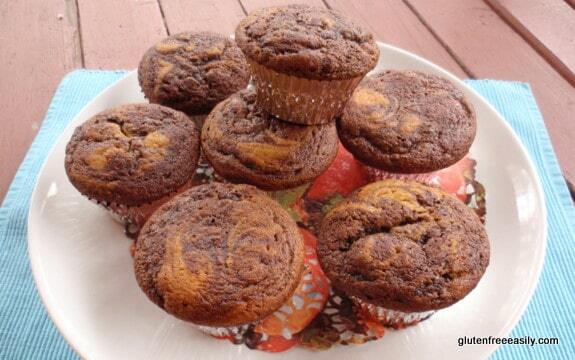 Let the cupcakes cool in the pan for 1 hour, then frost and serve. Frosting makes 1 1/4 cups. Who would guess that this super-rich and thick chocolate frosting is vegan? Frost over everything, or simply eat it with a spoon, like I do. Originally published April 10, 2011; updated October 19, 2017. Yippee! Elana is indulging us with yet another compilation of tasty treats which are not only delicious, but actually good for you:) Can’t wait to try some of the recipes…in due time. On a spring cleanse right now, but I see my just desserts! Hi Karen–Elana treats us so well, doesn’t she? Pun intended! Seriously, I love making her healthy recipes! These were so very good. 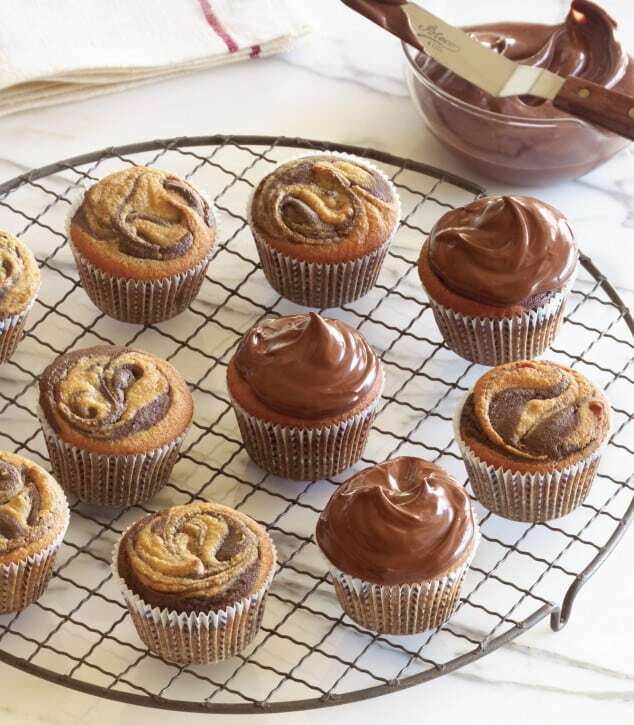 🙂 Just FYI, when you’re done with your spring cleanse, if you don’t have Elana’s book on hand by then, come back to this post to get the recipe as I got permission to add the recipe for the cupcakes and the frosting, plus a photo from the book. Enjoy! I can attest that this is one of my favorite cookbooks yet. My kids have already put sticky notes on all of the ones that they want me to make (I think more of the book is tagged now than not). What a great review Shirley! And your cupcakes look beautiful!! That looks simply fantastic (both the cupcake and the book!! ( I am looking forward to it, and appreciate the review. Hey Debi–Well, did you do it? Drop everything? Or did you resist? I must say you’ve been pretty busy of late … blogging like a mad woman! Love it! 🙂 Not sure if you saw that I added the recipes for the cupcake and the frosting, courtesy of Elana and 10 Speed Press. Oh, and there’s a super gorgeous photo, too! What beautiful, beautiful cupcakes! I bet they taste as good as they look. Thanks for getting the recipe for us and thanks to those who allowed it!!! Sigh, wouldn’t the world be a better place with more cupcakes? Here’s a great t-shirt: All you need is love, but a little chocolate doesn’t hurt! LOVE YOUR RECIPES AS ALWAYS! Kay Guest 🙂 “Swirl in figure eights” Boy Howdy, that sounds like fun!! Hi Kay–They are beautiful and easy—my favorite combo as you know! 😉 So I’m very grateful to Elana for the preview of her book and the recipes and photo to share! 🙂 I like your t-shirt idea, dear. Sounds like you could make a small fortune with it. Need any investors? OH man, those look amazing. Now I want some right now. How long does it take to make these? These are so pretty! I love when recipes from a cookbook or blog are easy to replicate. Your review did justice to the beautiful, healthy food that Elana makes! Shirley – we are twins! 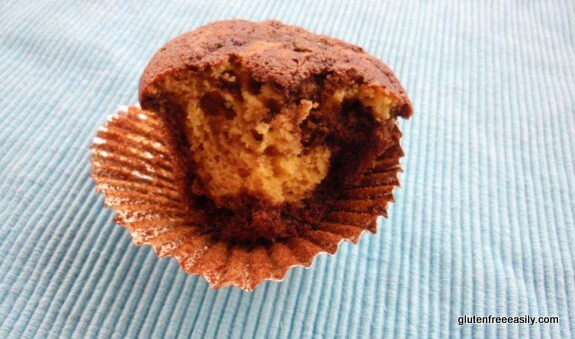 We both made and blogged about the same Marble Cupcakes from Elana’s new cookbook. Weren’t they fun to make? I especially loved swirling them with the toothpick. And you are so darn right about how healthy they are – you can’t feel guilty eating cupcakes that are made with such healthy ingredients, that’s for sure. Great review! Hi Ellen–They were so much fun to make! I liked the dolloping and the swirling parts. 😉 Thanks for telling me not to feel guilty. I ate more than my share of those marble babies. Guilt is a wasted emotion anyway, right? Wow Shirley, those came out amazing! I’m so eager to try some of these cupcakes once we get settled. I’ve got some bags of coconut flour waiting! Thanks so much, Alisa! I’m pretty proud of how they turned out. Elana makes us all looks so good, doesn’t she? 😉 Can’t wait to make these for Easter dinner which I’m hosting! I must have this book! I might buy extras for my friends so they have no excuse for just giving me a piece of fruit for dessert anymore. Just ordered it from Amazon! How funny. I’d never made cupcakes until C was declared gluten-free. My first – and very successful attempt – was using one of Elana’s recipes. I’m looking forward to the book. Thanks for this great review! These look great! Any suggestions on brands for the dark chocolate chips? I usually buy Enjoy Life chocolate chips, but they aren’t 73% cacao. Yum! This marble cupcake recipe sounds easy to make and delicious. What pretty marble cupcakes! They look delicious too, Shirley. Pinned. Thank you for sharing with us at the Hearth and Soul Hop.